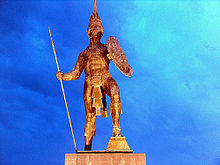 Monument to the Mayan chief Tabscoob in Villahermosa, Tabasco. Potonchán, was a Chontal Maya city, capital of the minor kingdom known as Tavasco or Tabasco. It occupied the left bank of the Tabasco River, which the Spanish renamed the Grijalva River, in the current Mexican state of Tabasco. Juan de Grijalva arrived to this town on June 8, 1518, and christened the river with his name and met with the Maya chief Tabscoob to whom, it is said, he gave his green velvet doublet. Later, on March 12, 1519, the Spanish conquistador Hernán Cortés arrived. Cortés, unlike Grijalva, was received by the natives in a warlike fashion, leading to the Battle of Centla. After the native defeat, Cortés founded the first Spanish settlement in New Spain, the town of Santa María de la Victoria, on top of Potonchán. The word Potonchán comes from the Nahuatl: "pononi" means "smell" and "chan" is a toponymic termination; therefore, it translates as "place that smells." Another, more plausible, etymology is that "poton" comes from the name the Chontal Maya called themselves: the Putún Maya which was also spelled Poton; thus it most likely translates as "Poton place." The city of Potonchán was located on the left bank of the Tabasco River, which was christened the Grijalva River by the Spaniards, and according to the chronicles of Bernal Diaz del Castillo, it was a league from the coast. The city was located on a small hill of sandstone, practically surrounded by water on three sides. On one side was, the river, and on the other two sides, swamps. It was in a region of extensive floodplains. Potonchán was the capital of the cacicazgo of Tabasco, and was one of two principal cities of the Chontal Maya, along with Itzamkanac, capital of the cacicazgo of Acalán. However, unlike Itzamkanac which was located in the midst of the jungle, Potonchán was a maritime port and fluvial, which allowed it to have an intense commercial exchange both with the towns of the Yucatán Peninsula and with those of the central High Plains. The Chontal Maya took full advantage of their environment, using the rivers as routes of transportation and communication with different Mayan cities and provinces. They were good navigators and merchants and controlled many maritime routes around the Yucatán Peninsula, from the Laguna de Términos in Campeche to the center of Sula in Honduras. At a point located between the current states of Tabasco and Campeche, the Mexica port of Xicalango was found with whom Potochán fought countless wars for control of the territory. The last of these great wars was won by Potonchán just before the year 1512. In tribute, the people of Xicalango presented several women to the chief Tascoob, one of which was Malintzin (famed as "La Malinche"), who would later be given to Cortés after the Battle of Centla in 1519. The little that is known of Potonchán is thanks to the chronicles of the Spanish conquistadors. With regards to its population, it is known that it was one of the most populated Mayan cities of the Tabasco Plain, because the cleric Juan Díaz, in his "Itinerary," speaks of the arrival of Juan de Grijalva's expedition in 1518, it "had more than two thousand Indians..."
For his part, Bernal Diaz del Castillo in Historia verdadera de la conquista de la Nueva España, says that when they reached Potonchán, it had "over twelve thousand warriors ready to attack [in the main square], plus the riverbank was all full of Indians in the bushes...."
Peter Martyr says in his chronicle, that "the great city flanks the river of Tabasco, so great that it has twenty-five thousand houses..." This gives us an idea of the size of the city and of the quantity of inhabitants Potonchán would have had, as well as the natives that were living in nearby towns under control of Potonchán proper. The city was very inhabited, the houses were made mostly of adobe. Potonchán counted on intense commercial activity, in fact, this was the predominant activity. Across the sea, Potonchán had an important river-based trade with towns like Guazacualco, Xicalango, Chakán Putum and Kaan Peech. It also had commercial ties to the Mayan provinces of Acalán and Mazatlán located in the jungles of what is today the border area of the states Tabasco and Campeche with Guatemala. This trade reached as far as the port of Nito on Guatemala's Atlantic Coast. Regarding the urban design of the city, very little is known. Owing to the nature of the place, in which many structures were made of "seto" (hedgerows) and "guano" (palms of genus Coccothrinax). In other cases, the vestiges disappeared at the initiation of Spanish construction of the town of Santa María de la Victoria, which was built over top the indigenous structures. The Tabascan historian Manuel Gil Saenz reports that around the year 1872, near the port of Frontera, excavations resulting from some "monterías" (logging camps) discovered several remains of columns, idols, jars, vases and even ruins of pyramids. Although the date of its foundation is unknown, it is known that it was due to the separation that occurred among the Maya of Mayapan and the Chontal Maya. The latter formed Potonchán's kingdom, whose head was Tabscoob, who ruled under the name of chief or lord of Tabasco. The encounter between Juan de Grijalva and the Mayan chief Tabscoob occurred in Potonchán on June 8, 1518. For its internal government, having the same Mayan costumes and laws, they adopted the same governmental system that existed from when they were united until the collapse of the Mayan empire. That is, with the three existing social classes: nobility and the priesthood, tributaries, and slaves. It was like that until the arrival of Hernán Cortés in 1519. The first Spanish expedition to touch Tabascan land was led by Juan de Grijalva, who on June 8, 1518, discovered for Western eyes the territory that is now the state of Tabasco. Grijalva arrived that day at the mouth of a great river, which the crew named "Grijalva" in honor of their captain, its discoverer. Juan de Grijalva decided to go down the river to discover the inland area, and found four canoes full of Indians, painted and making gesticulations and gestures of war. They showed their displeasure with his arrival, but Grijalva sent the Indians Julián and Melchorejo so that they could explain to the natives in the Mayan tongue that they came in peace. Thus they continued along the river and, after less than a league, discovered the population of Potonchán. We started eight days in June 1518 and going armed to the coast, about six miles away from land, we saw a very large stream of water coming out of a major river, the fresh water was spewing approximately six miles out to sea. And with that current we could not enter by said river, which we named the Grijalva River. We were being followed by more than two thousand Indians and they were making signs of war (...) This river flows from very high mountains, and this land seems to be the best upon which the sun shines; if it were to be more settled, it would serve well as a capital: it is called the Potonchán province. Once ashore, Juan de Grijalva, with the help of Mayan interpreters that he had taken earlier, began to strike up a friendly dialog. In addition to flattering the natives with gifts, Grijalva begged them to call their boss to meet and hold talks with him. And so, after a while, the chief Tabscoob appeared with his nobles to greet Grijalva. During the talk, both figures exchanged gifts: to Grijalva, Tabscoob presented some gold plates in the form of armor and some feathers; whereas Grijalva gave the Mayan chief his green velvet doublet. Hernán Cortés, Conqueror of Potonchán and founder of Santa María de la Victoria, first Spanish settlement in New Spain. Tabscoob told the Spanish captain of a place called Culua that was "toward where the sun set..." there was much more of that material. Grijalva in turn, spoke with the Mayan chief with courtesy, admitting that he came in the name of a great lord named Charles V, who was very good, and he wanted to have them as vassals. Tabscoob responded that they lived happily as they were, and that they needed no other lord, and that if he wanted to preserve his friendship with Tabscoob, Grijalva's expedition should leave. Grijalva, after stocking water and provisions, embarked on his way to Culua (modern-day San Juan de Ulúa). Nearly a year after, on March 12, 1519, the Spanish conquistador Hernán Cortés arrived at the mouth of the Grijalva river. He decided to have his ships drop anchor and enter the river in skiffs, in search of the great city of Indians described by Juan de Grijalva. Cortés landed right at the mouth of the river, at a place named "Punta de los Palmares." To discover their intentions, Cortés, by way of a translator, told some natives that were in a boat that "he would do no harm, to those who came in peace and that he only wanted to speak with them." But Cortés, seeing that the natives were still threatening, ordered weapons brought on the boats and handed them to archers and musketeers, and he began planning how to attack the town. Entrance of Hernán Cortés into the city of Potonchán in 1519. On the day following March 13, 1519, the chaplain Juan Díaz and Brother Bartolomé of Olmedo, would officiate what would be the first Christian Mass in the continental territory of New Spain. Afterwards, Cortés sent Alonso de Ávila with one hundred soldiers out on the road leading to the village, while Cortés and the other group of soldiers went in the boats. There, on the shore, Cortés made a "requerimiento" (requisition) in front of a notary of the king named Diego de Godoy, to let them disembark, thus issuing the first notarial act in Mexico. The natives refused, telling the Spaniards that, if they disembarked, they would be killed. They began to shoot arrows at Cortés' soldiers, initiating combat. Alonso de Ávila arrived to the combat developing within Potonchán with his hundred men who went traveled by land, making the Indians flee and take refuge in the mountains. In this manner, Cortés took possession of the great main square of Potonchán, in which there were rooms and great halls and which had three houses of idols. The next day, Captain Cortés sent Pedro de Alvarado with a hundred soldiers so that he could go up to six miles inland, and he sent Francisco de Lugo, with another hundred soldiers, to a different part. Francisco de Lugo ran into warrior squads, starting a new battle. Upon hearing the shots and drums, Alvarado went in aid of Lugo, and together, after a long fight, they were able to make the natives flee. The Spaniards returned to town to inform Cortés. 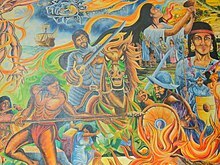 Hernán Cortés was informed by an Indian prisoner, that the Indians would attack the town, so he ordered that all horses be unloaded from the ships and that soldiers prepare their weapons. The next day, early in the morning, Cortés and his men went through plains to Cintla or Centla, subject towns of Potonchán, where the day before Alvarado and Lugo had fought against the natives. There they found thousands of Indians, beginning Battle of Centla. The Spaniards were attacked by Chontal Maya Indians. The Spaniards defended themselves with firearms like muskets and cannons, which produced terror in the Indians, but what terrified them more was seeing the Spanish cavalry, which they had never seen. The Indians believed that both rider and horse were one. In the end the Indians lost, owing primarily to the higher technology of the Spaniard's weapons. 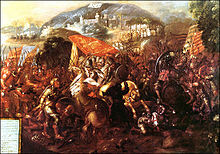 After the battle ended, Cortés and his men returned to Potonchán, and where they healed the wounded and buried the dead. On the following day, ambassadors sent by Tabscoob arrived at the Spanish camp with gifts because, according to Indian tradition, the loser must give gifts to the winner. Among the gifts were gold, jewelry, jade, turquoise, animal skins, domestic animals, feathers of precious birds, etc. Image of Mass in Potonchán. First Mass celebrated in the territory of New Spain. After baptising the 20 women that were presented to him, Cortés met with the chief Tabscoob and other indigenous authorities, who informed him that, in a place called Culúa, there was a very big city and there was much gold. Cortés decided to continue his journey to that place. But before, on March 25, 1519, he founded the village Santa María de la Victoria, which would be the first Spanish settlement in New Spain, on top the Maya town of Potonchán, and named in memory of the battle fought on Lady Day. He commanded the construction of an altar for placing an image of the Virgin Mary that he decided to leave there. In addition he built in the village of Cintla or Centla a wooden cross from a ceiba, to be placed in the center of the square. Later, on Palm Sunday, after the celebration of Mass and in the presence of indigenous authorities, Cortés says goodbye to them and continues his journey. :83 Leaving a group of 60 soldiers in the newly founded village of Santa María de la Victoria, he gave them the mission to pacify the region. After that, Cortés left toward Culua (modern-day San Juan de Ulúa, Veracruz), in search of the riches of the great empire "...from there, where the sun sets." ^ Cabrera Bernat 1987, p. 25. ^ Cabrera Bernat 1987, p. 41. ^ Gil y Sáenz 1979, p. 87. ^ a b Gil y Sáenz 1979, p. 76. ^ Gil y Sáenz 1979, p. 75. ^ a b c Gil y Sáenz 1979, p. 80. ^ a b c Cabrera Bernat 1987, p. 42. ^ Cabrera Bernat 1987, p. 43. ^ Cabrera Bernat 1987, p. 44. ^ Cabrera Bernat 1987, p. 45. ^ Townsend, Camilla. Malintzin's Choices. University of New Mexico Press, 2006, p. 55.